Paranoid Image Image is proud to present to you our biggest, most exciting show yet. 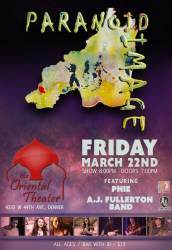 It's our Spring Kickoff show at the fantastic Oriental Theater! PLUS... what would a major Paranoid Image show be like without a good number of extremely talented and visually captivating dances and performances along with our music? 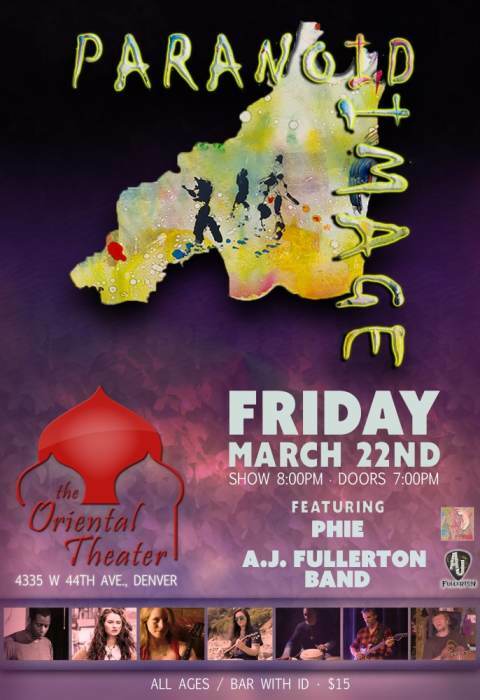 Tango, belly dance, acrobatics, samba, bachata and more will be featured by some of Denver's best performers! We are incredibly excited to bring you a show that features two very popular and extremely well-liked bands! PHIE (Sophie Wilson) is a dream pop singer/songwriter, and keyboardist from Denver. It’s Lana Del Rey meets Taylor Swift with PHIE’s sweet vocals, washy guitar, and vulnerable lyrics. In July of 2017 she released her debut EP “Reckless”, which landed her in the top 10 for 93.3’s Hometown For The Holidays. The following year, she released her fan favorite single, Rage, also featured on 93.3. Working with the well-established producer, Ted Bruner, she continues to write music and perform at Denver’s favorite local venues, proving herself a rising force in the Denver music scene. Check out her recorded music... then be wowed when you see her live! unprecedented 8 awards for: Best Guitarist, Best Solo/Duo, Best Band, Best Male Vocals, Best Slide Guitar, Best Songwriter, Best Acoustic Act, Best Local Recording (“Kalamath”). Plus, he was mentioned in the Oct. 2018 edition of Rolling Stone (Fr) as one of the top up & coming artists out of Colorado. 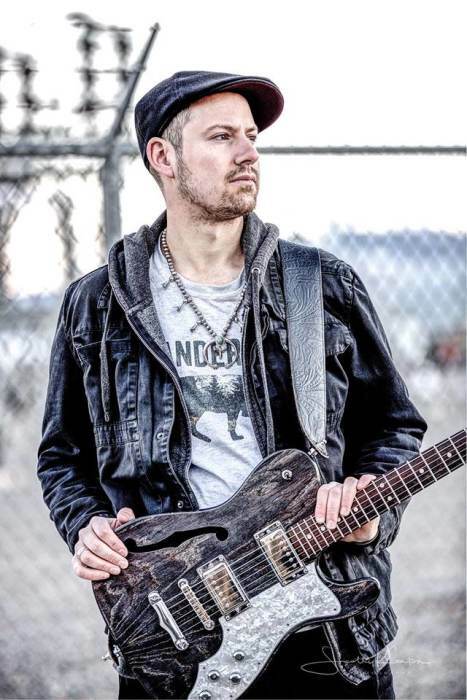 "... his outstanding slide ability, steaming vocals, and incredible finger-picking style, almost sounds as though he brought the blues back from the dead..."
Can't wait to see you at this truly terrific show and experience the exciting music and entertainment with you! Get your tickets now... $15 now or $18 at the door. Christopher Malone and Sara Geller met in May 2015 when they both arrived for their first rehearsal with the band Scifidelic. This is a very cool industrial band where Christopher is the bassist and Sara was the backup female vocalist. Once they met, they quickly realized that they had the same love for music and constant drive to create. They began working on some jazz, blues and (yes) tango songs they could perform outside of Scifidelic. Not long after they met, they became a couple and began studying dance and exploring all types of Latin American music and dance styles. They also began looking into ways that Sara's truly unique and otherworldly voice could be showcased and recognized. That is when, in 2016, Sara decided to leave Scifidelic and the two of them decided to create their own band. As it it is with most musicians that have such a strong drive, they wanted to create something unique, different, palatable, and encompassing of their combined idea for a new sound. With Christopher's roots in alternative music, industrial music and love of driving, dance-inspiring rhythms as well as emotional and touching melodies and Sara's flare for South American dance, blues and jazz styles, and unique voice, they wanted to create music that would be enjoyed by those who love to dance - salsa, bachata, zouk, tango, samba - and would be excited by music that was not the normal "standard" sounds that they are typically exposed to. And the catch? Get away from the electronica of industrial - but keep the drive - and away from the instrumentation typical of rock or South American music. How about folk music style instruments? No electric guitars or electric bass or drum sets. Mandolin, acoustic guitar, banjo, piano, and hand percussion, etc.? Yep. That should work. And it did work. Quite well. Christopher and Sara pondered about what to call the band. Sara, an art history major and artist said that the concept reminded her of the "Paranoiac-Critical Method". "The paranoiac-critical method is a surrealist technique developed by Salvador Dalí in the early 1930s. He employed it in the production of paintings and other artworks, especially those that involved optical illusions and other multiple images." We thought that it described the kind of fusion of music we wanted to create. Paranoic-Critical Method was kind of nuts for a band name, so we shortened it to Paranoid Images, then again to Paranoid Image. The Paranoid Image logo was created from a monoprint, artwork that was created by Sara. Using that as the foundation, Christopher created the oddly shaped logo (it's a random shape... not a country!). It took a while to find the right musicians who "get it" - our concept - and have the true talent to make it happen. Christopher was attending a "picking circle" on Thursday nights at Denver's Tennyson's Tap when he was fortunate enough to meet Lauren Savelle, PI's first permanent member. He was impressed by Lauren's spirit and talent on the mandolin. It was great meeting someone who "got it"! 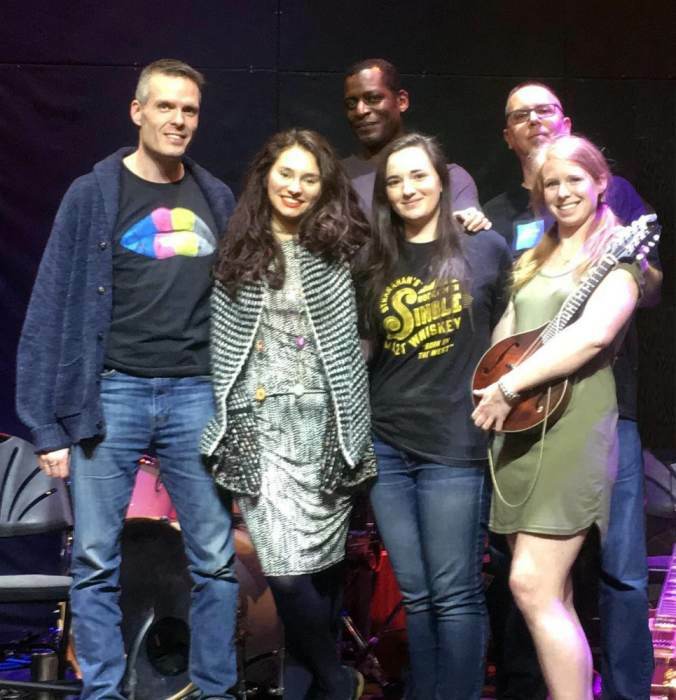 There were several other musicians who came and went, but it was when he found Elizabeth Nelles, an extremely talented multi-intstrumentalist, through a band app that he was convinced this would actually happen! Christopher was encouraged by his brother, Kyp, who is a member of the band TV on the Radio, who told him that the idea was very exciting and to keep at it. Paranoid Image released its first single, a cover of TVOTR's "Keep Your Heart" in January 2018. Over time, as songs were being created and the sound was being perfected (which it still is! ), the permanent members of PI joined the group: Al Buffone III, the diverse and talented percussionist who encompasses what PI is all about; Jim Vaughan, the extraordinary perfectionist guitarist whose rhythms and solos take PI to another level; and Louie Sosa, our newest member whose skill, talent and ear was for the longest time the perfect missing link to what was needed to complete the unique percussion that helps define PI. After six months of very hard work, in June 2018, Paranoid Image was extremely proud to release our first full album of 10 songs, titled Burning Paint, an album that shows the diversity and eclectic nature of what we have created. We work very hard every week perfect our current songs for performances and work on new ones, as we continue to define our sound and allow our creativity to flow. New songs are being written and worked on, all while staying true to that PI sound - acoustic instruments and hand percussion (for the most part). While we still cannot define exactly what our quirky, eclectic "genre" is (acoustic Latin, grunge, disco, ballad, funk, etc...), we hope you enjoy at least a little bit of our art both now and what we are continuing to create! - Best Local Recording (“Kalamath”) has played such events as; The International Blues Challenge in Memphis, TN., The Telluride Blues & Brews Festival, The Clarksdale Juke Joint Festival, Bohemian Nights New West Fest, and The Durango Blues Train. Playing on average 200-250 shows each year, A.J. is often hailed as, “The Real Deal", and is frequently called one of the hardest working young musicians on the scene.